Government Accountability Office (GAO) serves as a “fiscal watchdog” that seeks to improve the financial performance of the federal government, and ensure accountability to Congress and the American people. GAO’s provides Congress with fact-based, nonpartisan information aimed to improve the federal government’s efficiency and ensure accountability for the benefit of the country. Over the years, the agency has earned a reputation for being fact-based, with nonpartisan reviews of government activities, while uncovering serious accounts of mismanagement and waste by government operations/agencies. 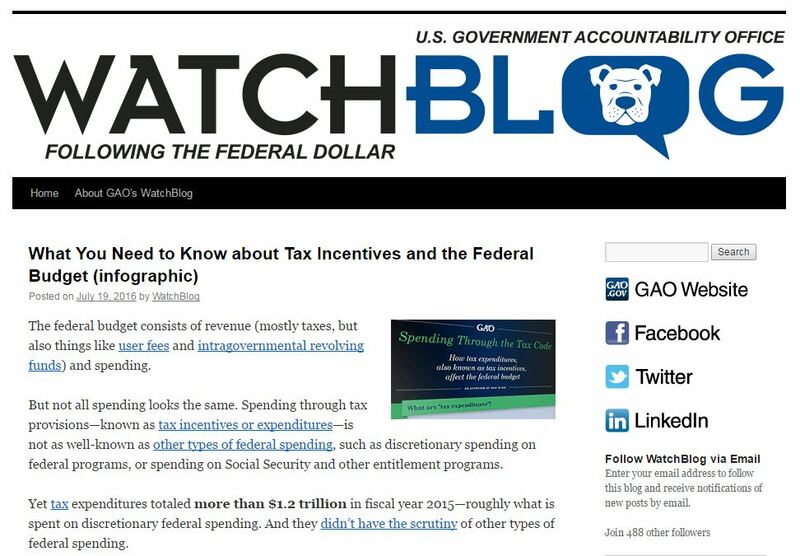 In January 2014, GAO launched WatchBlog as part of its continuing effort to reach its audiences—Congress and the American people—where they are currently looking for information. The blog format allows GAO to provide more context relating its work than it can offer on its other social media platforms. Posts will tie GAO work to current events and the news, as well as illustrate how GAO’s work is affecting agencies or legislation. 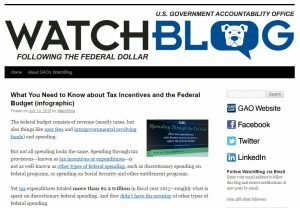 The WatchBlog is a good resource for understanding various projects, programs, or agencies, and their effectiveness in serving the public. GAO typically publishes several posts a week, so new content is consistently being produced. In addition to posts on various government topics, GAO includes infographics and podcasts to provide information in engaging formats. GAO WatchBlog also provides to their agency, or the agency/project that is the subject of the post. The Government Accountability Office’s agency webpage also provides comprehensive information relating to bids, appropriations, and key issues like social security or the national debt. The GAO operates as a “just the facts” type agency examines government efficiency, and provides overview to national issues supported with documentation. Researchers can browse by topic or agency to view these issue reports. So the next time you are trying to understand a political/national issue without the political slant typically found with the media, take a look at work produced by the Government Accountability Office.